Dementia can take a serious toll on a senior’s brain health. Although there are no guaranteed ways to stop this disease from getting worse, there are many steps seniors can take to slow its progression. Keep the following in mind while providing care for a senior loved one with dementia. Eating a diet loaded with saturated fats, processed foods, and other foods that are considered unhealthy can have a negative impact on brain health. Cutting back on these foods and including more foods that promote a healthy brain can reduce the risk of dementia becoming worse. Foods that are good for the brain include fruits, vegetables, and other foods with antioxidants. Salmon, walnuts, and other foods with omega-3 fatty acids also support brain health. Your loved one should exercise on a regular basis to increase circulation in the brain, which helps it stay in good condition. Exercising regularly can also boost cognitive health. Your loved one doesn’t have to do rigorous physical activity to gain these benefits. Moderate amounts of exercise, such as going for walks each day, are enough to maintain healthy cognitive function and slow the effects of dementia on the brain. If your loved one finds it challenging to remember to do simple tasks such as exercising regularly, that doesn’t mean he or she can’t age in place. Many seniors prefer aging in place over moving to an assisted living facility. If your senior loved one needs assistance to remain safe and comfortable while living at home, reach out to Home Care Assistance, a leading Huntington senior care agency. Our dedicated in-home caregivers can assist with meal prep, bathing and grooming, exercise, medication reminders, and many other important tasks. Seniors who spend time with friends are less vulnerable to experiencing cognitive decline. If you have a loved one with dementia, make sure he or she has plenty of opportunities to socialize with others. Arrange for your loved one to visit friends or have friends come over to his or her home. You can also look into community events for seniors that allow them to spend time with other people their age, such as game nights or trips to local attractions. Doing challenging exercises that engage the brain can help seniors form stronger connections among their brain cells, which can slow the progression of dementia and keep the mind sharp. Make sure your loved one has a variety of mental activities to do on a daily basis, such as crosswords, word searches, and other brain puzzles. Other activities that challenge the brain include learning a new skill, reading, and playing board games with others. 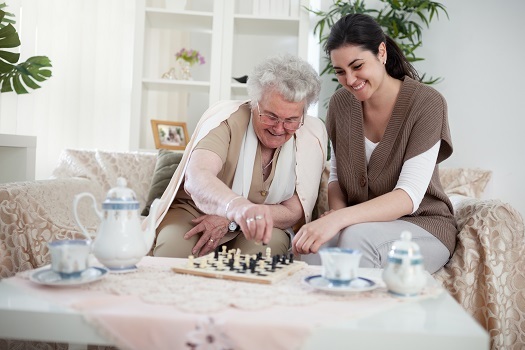 Some seniors may need a bit of extra help to engage in brain-exercising activity, and a trained professional caregiver can provide valuable mental stimulation. If your senior loved one needs professional dementia care, Huntington caregivers are available around the clock to provide the high-quality care he or she needs. Using the revolutionary Cognitive Therapeutics Method, dementia caregivers can help your loved one stay mentally engaged and delay the progression of the disease. A good night’s rest can be difficult for seniors to get regularly, which can make the effects of dementia worse. You can enhance your loved one’s sleep quality in a few ways. Encourage doing a relaxing activity before bed, such as reading, and make sure the bedroom isn’t too hot or cold. Your loved one should also have a firm yet comfortable mattress to sleep on, which may make it easier to get a better night’s sleep. These suggestions may help your loved one stay healthier longer. With assistance, seniors with dementia can age in place, surrounded by familiar sights, sounds, people, and beloved mementos. If your senior loved one needs professional in-home care in Huntington, Home Care Assistance is here to help. We are a trusted provider of respite and 24-hour care, and we also offer specialized Alzheimer’s, dementia, Parkinson’s, and stroke care for seniors. Reach out to us at Home Care Assistance if you need compassionate, professional care for your loved one. Call one of our dedicated Care Managers today at (304) 521-2909 to learn about the high quality of our in-home care services.